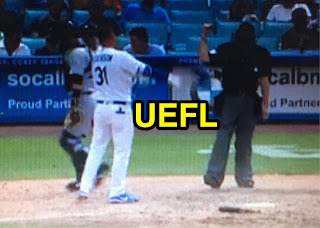 HP Umpire David Rackley ejected Dodgers CF Joc Pederson (strike call/throwing equipment) in the bottom of the 7th inning of the Padres-Dodgers game. With two outs and two on, Pederson took a 1-0 and 1-1 pitches from Padres pitcher Brad Hand for called first and second strikes, before striking out swinging on the ensuing pitch. Replays indicate the called first strike was located over the heart of home plate and thigh high (px -.192, pz 1.760 [sz_bot 1.589]) whereas the penultimate pitch was located over the heart of home plate and knee high (px .728, pz 1.622 [sz_bot 1.589]), the call was correct. At the time of the ejection, the Dodgers were leading, 10-2. The Dodgers ultimately won the contest, 10-2. This is David Rackley (86)'s first ejection of the 2017 MLB regular season. David Rackley now has 4 points in the UEFL Standings (0 Previous + 2 MLB + 2 Correct Call = 4). Crew Chief Larry Vanover now has 2 points in Crew Division (1 Previous + 1 Correct Call = 2). Prop Bet 8) Second Ejection - Team: Dodgers. Winners: BkSl14812 (5 pts), jvick2017 (5 pts). This is the second ejection report of 2017. This is the 1st player ejection of 2017. Prior to ejection, Pederson was 0-3 (2 SO) in the contest. This is LA's 1st ejection of 2017, 1st in the NL West (LAD 1; ARI, COL, SF, SD 0). This is Joc Pederson's first ejection since September 18, 2016 (Ryan Blakney; QOC = Y [Balls/Strikes]). This is David Rackley's first ejection since August 25, 2015 (Pat Murphy; QOC = U [DiMuro]). Wrap: San Diego Padres vs. Los Angeles Dodgers, 4/6/17 | Video via "Read More"